A barn quilt is made of two sheets of high-grade plywood (MDO plywood), 8′ x 8′ square, which has an individual quilt block pattern painted with specifically chosen outdoor paint and sealed to withstand the weather. Other sizes can be made (4′ x 4′) but the larger size create a bigger impact. Looking to add a little character to your barn? Barn quilts not only add interest to your barn, but they grab the attention and interest of people driving by. Barn Quilts celebrate quilting as a traditional art form, appreciate the architecture of farm buildings and rural landscapes, promote art appreciation, and stimulate county economic growth while celebrating our agricultural heritage. Barns, corn cribs, public buildings, homes, gardens, open spaces are the locations of mounts chosen for the heritage quilt designs. 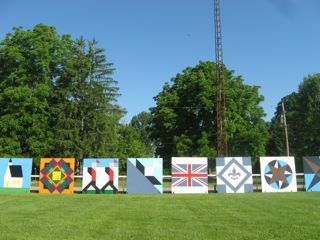 Barn Quilts on display in Wardsville, Ontario, prior to installation on local barns. How do I choose a block? Anyone in the Smithville area involved? Hi Sharon. We used EQ Blockbase for barn quilt block selections. Thousands of patterns. We just enlarged using geometry skills to fit an 8’x8′ plywood square.